Marantzidis Alexis, engineer – mechanic, President, manager and collection development. Vekris Haris, economist, Vice President, responsible for strategic planning. Mavrikou Maria, an economist, Management Science, PhD, University of Athens, General Secretary in charge of public relations. Kazantzaki Maria, lawyer, Special Secretary, responsible for legal support. Vasilikos Nikos, tour operator, Treasurer, responsible sponsorship. The Museum is happy to announce that the documentary “Patris, Lost in 1868” won an award at the International Film and Video Festival, organised by the Archaeology Channel between May 18th and 22th, 2010 at the Soreng Theater, Hult Center for the Performing Arts in Eugene, Oregon (USA). A hundred films from 32 countries entered the festival. Nineteen were chosen to compete. 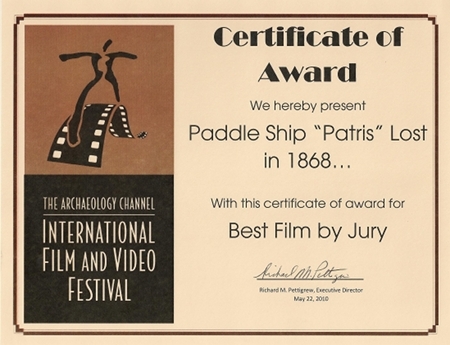 “Patris, Lost in 1868″ won the Best Film (by Jury) as well as the Best Cinematography (by Jury) awards. This is a significant distinction, as the Greek production faced brilliant competition entries from the likes of the National Geographic and the History Channel. In November and December 2009, Mr. Constantinos Filippou, who had already donated a large collection of ship schematics and a complete naval technical office including its instruments to the Museum, funded the digitisation of the schematics collection. Interested researchers may now study these schematics in the Museum library. In December 2009, Mr. Demetris Voikos, a mariner, donated the blacksmiths’ tools his father, George Voikos, had used in his workshop from the 1940s to 1977 to the Museum. On January 19th, Mr. Pavlos Alifragkis, a carpenter, donated all his equipment and tools to the Museum. These tools had been used by his family for three generations. A museological-museographical study, which aims to upgrade and update the Museum’s existing collections, is already under way.